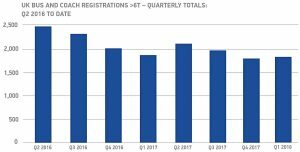 Registrations decline in first quarter. Double-digit drop for double- and single-deckers, but minibuses bounce back. New bus and coach registrations fell 4.5% in the first quarter of 2018, according to Society of Motor Manufacturers and Traders (SMMT) figures. There were 1,793 PCVs hitting the UK’s roads in the period. This is the fifth consecutive quarter the UK’s new bus and coach market has fallen. Double-decker figures declined 37.8% to 301 units, while single-deckers fell 18% to 461. Minibus demand returned after five quarters of negative growth, up 24.1% to 1,031. Registration totals by marque in the period (with Q1 2017’s figures in brackets) were: Ford 579 (467), Mercedes-Benz 345 (234), ADL 234 (290), Volvo 153 (302), Peugeot 110 (139), Scania 81 (41), Wrightbus 57 (96), Citreon 29 (16), Iveco 26 (16), VDL 25 (31), Caetano 25 (24) and others 129 (221).